The Library, as part of its Digital Humanities remit, hosted a workshop on Data Visualization in the Humanities led by external presenter Mia Ridge. Mia began by outlining the historical development of visualization – starting with examples such as John Snow’s Cholera Map (1854), Florence Nightingale’s Petal Charts (1858) and Minard’s map of Napoleon’s Russian campaign of 1812 (1869); and highlighting the power of the visualization in enabling the viewer to understand data easily on multiple axes at the same time. She then moved on to show more recent types of visualization – mashups, infographics, text analysis, visualizing images and video and network visualizations. Visualization needs to be approached carefully, with proper consideration given to audience and purpose. For example, will your visualization be a product, or a process – will it be used to explain, or explore your dataset? Over-emphasis of one aspect of the data may de-emphasise another, for example, Beck’s tube map of 1951 emphasises connections but de-emphasises geographical proximity. Some visualization tools and softwares may have inherent bias built into them depending on what audience they were designed for. The algorithms used may not be transparent, for example with Google’s N-gram tool. Visualizing “sentiment” analysis is not an exact science. Current algorithms can work with words, but take no account of tone or register (or even emojis!). 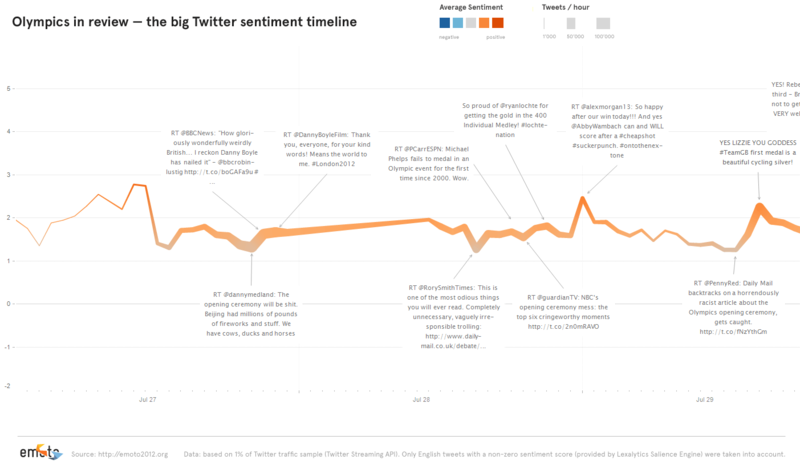 For an example of “sentiment” analysis, see the Twitter visualization of the Olympics in 2012. As well as the time to get hands-on with and evaluate various visualization tools, it was great to see and hear about the work already being done in this area by colleagues around the University, for example Kathryn Rudy from the School of Art History – and of course the exciting digital humanities projects taking place in the Library. For more information on digital humanities at St Andrews, contact Dr Alice Crawford in the Library – or catch up with her blog. This entry was posted in Events, Home and tagged colleagues, data visualization, digital humanities, event, good practice, tools by Margaret Adamson. Bookmark the permalink.